As the Death Arcana: Mae leading Anthem to his destruction. That's freaking amazeballs! Guess I can have a new avatar when I get home! I'm pretty sure Sir Anthem wouldn't have submitted to a forced-march, neither would Mae have been merciful enough to give him one. But the art! I love the little details, like the horse's bit & bridle being off centre as if they were actually going (or have been going) someplace. What's the meaning of the silver rose flag, though? I think wangxiuming is doing a series of Major Arcana tarot cards, so some artistic liberty can be expected. To me, these pieces are more about symbolism than they are about accurately depicting IC RP. The fact that wangxiuming thinks Mae symbolizes Death says a lot about how well you've RP'd her! Arn is right! And thank you Arn. 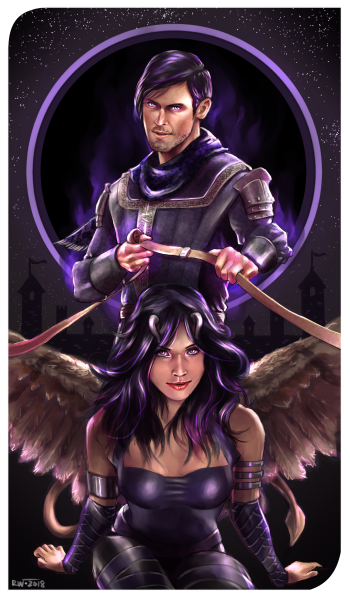 For all of the last few cards I've pulled together different elements/symbols from their original Tarot cards and incorporated characters from BG into them. I also considered the meanings of the cards and tried to choose the ones I felt resonated for each character. My takes on the cards are not supposed to represent actual events, but to kinda merge the major symbols of the original cards with BG characters and the major themes of their IC character arcs. In my admittedly basic understanding of Tarot, the Death card encapsulates endings, beginnings, transformation and change. I thought the revelation of Mae's treachery and manipulation of Anthem would fit with those themes in a couple ways. First, obviously the whole affair led to the end of Anthem's life. Second, it could also represent Mae's "transformation" from apparent Helmite guardian to the nefarious villain she's seen as now. 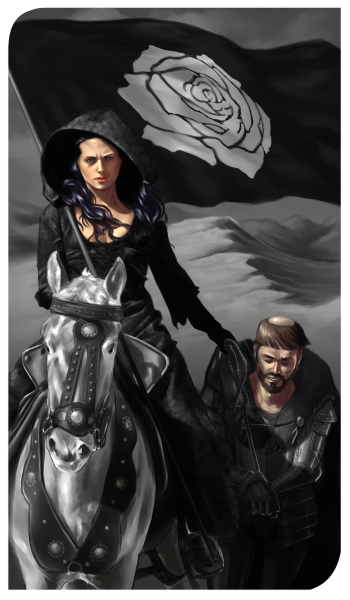 In terms of symbolism, the original Death Card has the figure of Death riding a white steed, bearing a black flag with a rose on it. Figures of varying station - including a bishop - prostrate themselves before Death, because Death does not discriminate (the site I linked does a better job of explaining the meaning behind each symbol). For my take, I substituted Mae for the figure of Death and thought Anthem would make a fitting bishop. While Mae did not actually lead Anthem down a forced march, her holding the rope and leading him in the picture is intended as a metaphor for how her guidance/manipulation would eventually lead to his death. tldr: I tried to mash together symbols from actual tarot cards with metaphors/themes from IC RP. I think it's absolutely fantastic, even more that the symbolism is explained! How much do I owe you? Seriously, I'll pay for art like that! Wangxiuming, I say it all. the. damn. time. You never cease to amaze me with your art, and it's complexities. Never stop painting. PS: I legit want this as a deck. Amazing artwork. I love to come back here and check every time you post something new and it also makes me curious of the stories of the characters I haven't interacted much with. Tsidkenu wrote: I think it's absolutely fantastic, even more that the symbolism is explained! How much do I owe you? If wangxiuming took money, I would have paid him to put Mi-Le on a tarot card months ago. Seriously, I would pay for that. You folks are all too kind. I love all of these so much because not only is the art fantastic, every single one of them really captures the fundamental essence of the character's personalities. Cyrus as the Chariot, featuring Valkira as a winged sphinx. that captures them both great!